Time to Rethink your Eggs? – microBEnet: the microbiology of the Built Environment network. 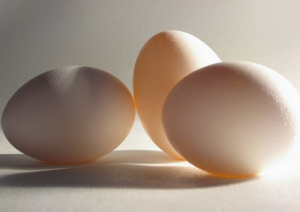 home Topic: Nonhumans in the BE Time to Rethink your Eggs? Time to Rethink your Eggs? New research findings have provided helpful conclusions to help you become a more conscientious consumer of eggs. As summarized in this news article, findings related to animal health, consumer health, worker health, environmental impact, and affordability are outlined. The three housing types they looked at were battery cages, enriched colony housing (arguably more humane than the conventional cages), and cage-free. (1) The low levels of shedding and prevalence of Salmonella (a bacteria that can make chickens and consumers sick) was similar between the 3 housing types studied. (2) The highest microbial quantities were found on the eggs and litter area of the cage-free system, and on the scratch pad in the enriched colony housing. High microbial load isn’t necessarily a bad thing. Given that Salmonella prevalence was similar in all housing types, I don’t think this finding has much weight towards animal, consumer, nor worker health. This point is echoed by the findings that the immune systems of the hens and the effectiveness of their Salmonella vaccinations was not correlated with housing type. That said, the eggs of the cage-free system and the scratch pads in the enriched colony housing also showed to have the highest levels of total aerobes and coliforms. These are parameters used to measure the sanitary level of food and/or water. Again, this isn’t a direct health and food safety concern in my opinion, especially since it was found that there are just higher microbial loads in these samples already. (3) The study found that dry belt manure removal systems were helpful in removing Campylobacter species from the chicken’s living space. Dry belt manure removal systems are automatic conveyer belts that catch manure and remove it from the cages typically found in a conventional cage setup. Campylobacter is the most common cause of food poisoning in the US. The cage-free setup creates a much worse environment for workers compared to the other setups. The findings point to poorer air quality for the workers including, “significantly higher concentrations of airborne particles and endotoxin – toxic components of bacteria”. The article also points out ergonomic concerns for workers repeatedly picking eggs off of the floor. Egg quality was similar in all 3 housing types, but did correlate with the diet of the hens. The nutrition of the feeds depends not on the housing type, but on the farm itself. The better diets are obviously correlated with more expensive operating costs. The conventional, battery cage setup is the cheapest to operate and for consumers. Eggs from an enriched colony setup would cost an average of 14% more and eggs from a cage-free system would cost an average of 36% more than eggs from a conventional setup. There is a lot of social pressure today to be conscientious consumers. In terms of consumer health, animal health, worker health, and affordability, this study provides solid evidence that conventional farms are the best way to go. However, even though there wasn’t evidence for it in this study, I do believe there is a better taste/quality/nutrition associated with non-conventionally farmed eggs. I speak from experience, not science, when I say that. I also think it is important to mention that this study excludes findings related to humane conditions, which is arguably the most important part of the pressure to be an educated consumer. There are two functioning definitions of humane: (1) the animal has at least the bare minimum of what it needs to survive (2) Animals are in an environment where they can move around, express their natural behaviors, and be exposed to natural light and air. Of course animal ‘happiness’ is much harder to quantify, but there are industry standards to measure this that weren’t included in this study. This is a non-peer reviewed report published by an industry front group (http://www.sourcewatch.org/index.php/Center_for_Food_Integrity). Surprised to see it distributed by MicrobeNet. Well, I take responsibility for this. We have a place (in a Slack site) where we share links for possible blog posts. And I shared this one and pointed Katy to it. I just did not dig around enough into this story. Sorry about that and thanks for pointing this out.